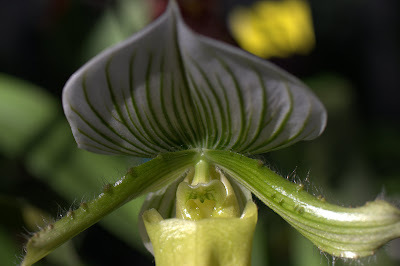 Orchids have over 22,000 accepted species. The number of orchid species equals about four times the number of mammal species, or more than twice the number of bird species. This unusual tropical hybrid variety caught my eye during a visit to McDonald's Garden Center in Virginia Beach late this afternoon. Canon 40D, 1/200 sec at f/4.0, ISO 100, Canon 50mm compact macro lens.